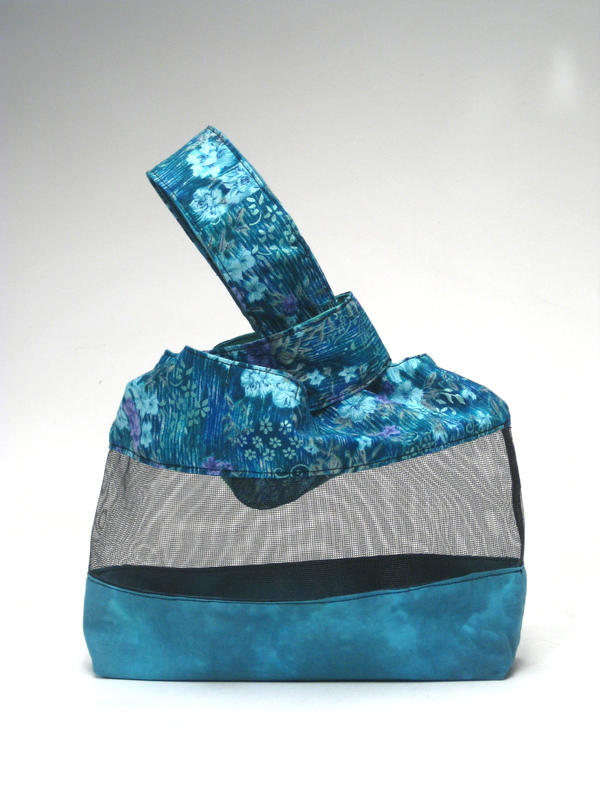 Wild Onion Japanese Knot project bags for knitting, crochet, and more! Confession: I used to keep my projects in clear plastic bags. I longed for a cuter way to bring my craft items to meetings, so I experimented with different patterns and methods until I designed the Wild Onion Knot bag! It really suits my needs, and I know you’ll love it too! Japanese knot bags feature loop handles, with the longer loop fitting through the smaller loop to close the top of the bag. Slip the handle over your wrist, and you can even craft on the go! 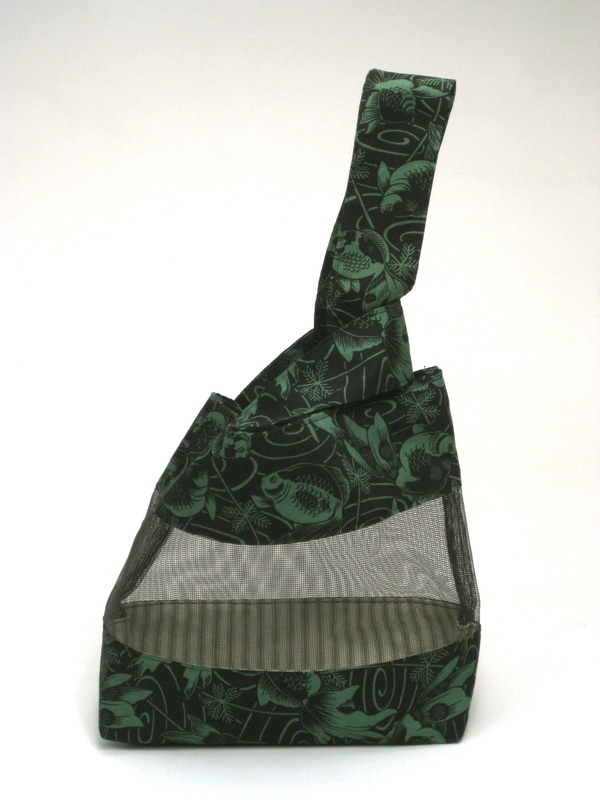 It’s also great for moms and teachers, as a travel bag, or even a lunch or market bag. Lightweight, it folds easily, and can be tucked away for unexpected purchases. What sets my bags apart from the rest? First, my Wild Onion Knot bag features see through mesh sides, which allows you to see your project inside the bag–at a glance! No more guessing at the contents of your bag. Second, the Wild Onion Knot bag features a flat, boxed bottom, stiffened with lightweight interfacing, so it can stand up on its own. Just grab the yarn end and knit or crochet away, without worrying about your ball of yarn bouncing around the floor, getting dirty! 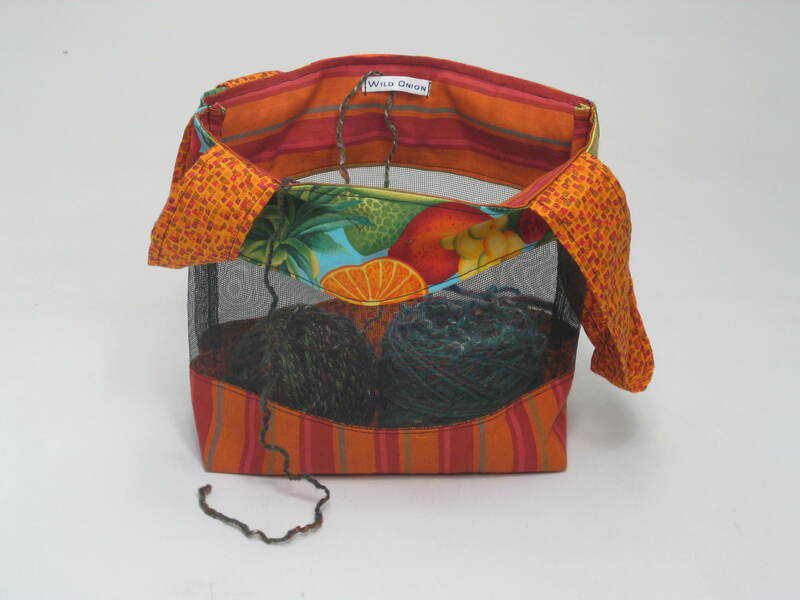 The bag is a tote AND a portable yarn bowl. Third, I’ve encased all the seams for a snag-free interior. There is nothing to grab at your precious yarn. No rough seams, no buttons, no snaps, and definitely no zippers! Bonus? Use the Wild Onion tag as a yarn guide! Colorwork? Use the tag and the handles as yarn guides, to stay tangle-free. The bag will hold 2 – 3 balls of yarn, plus a shawl or sock sized project. I use premium fabric, which can be hand washed and air dried, as needed. 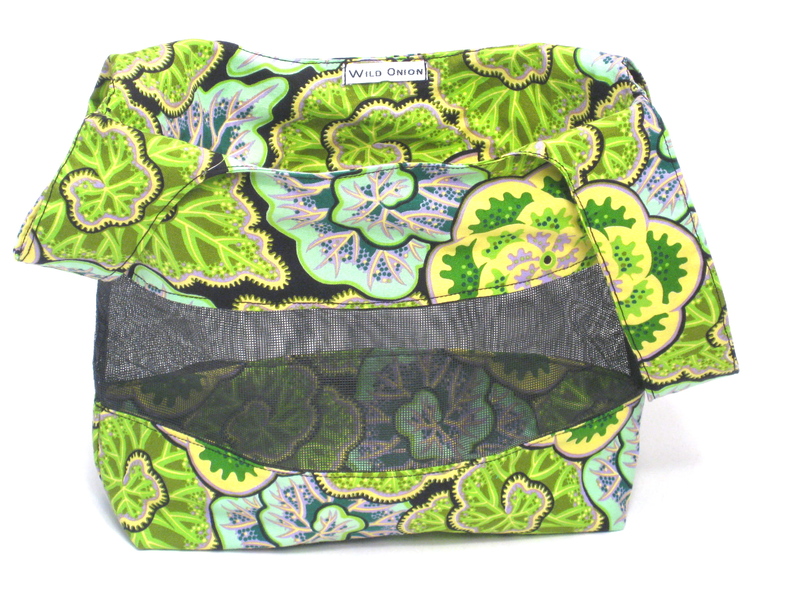 The lining will match or coordinate with the main fabric; as a long-time professional quilter, I have a lot of experience putting fabrics together, and I have enjoyed coordinating your bag lining! I have done my best to accurately portray the true colors of the fabric, however computer monitors can vary. Listing is for the bag only, yarn not included. Ready to Ship from my smoke-free, pet-free studio! Visit my Wild Onion Etsy shop now to see what’s in stock for you! These are groovy beyond words!! !